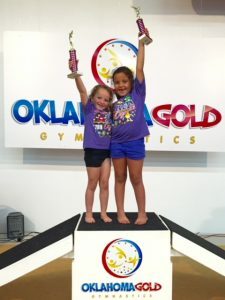 Oklahoma Gold Gymnastics aims to create a recreational program where each child can feel a sense of accomplishment for their hard work and have the experience of standing on the top of the podium like competitive gymnasts do. In 1989, before Oklahoma Gold Gymnastics was born, Coach Steve created the M&M Olympics when he was coaching competitive boys gymnastics. It has been a staple and family-favorite at Oklahoma Gold since. During the last week of Session 4, Oklahoma Gold hosts our annual exhibition program called the M&M Olympics. At the M&M Olympics students will show the skills and routines they have been working on in class. We invite family and friends to come watch their gymnast on each apparatus, take pictures and celebrate four sessions of hard work. Per Olympic tradition, our gymnasts will participate in an opening ceremony march-in and a closing awards ceremony where each gymnast will be awarded a trophy and a bag of M&M candies. Each student is also given a special M&M Olympics t-shirt. Tuition below is for 1 class per week for 9 weeks. There is a 10% discount for adding additional classes. Due to the M&M Olympics, we will be closing registration for this session after the second week of the session.